C’MON, THERE’S *ALREADY* A BUBBLE! SOME OF THE DENIERS …..
“The Reserve Bank has cautioned against ‘unrealistic alarmism’ about a possible property bubble in Australia, a day after it offered a muted warning to banks about prudent lending standards. 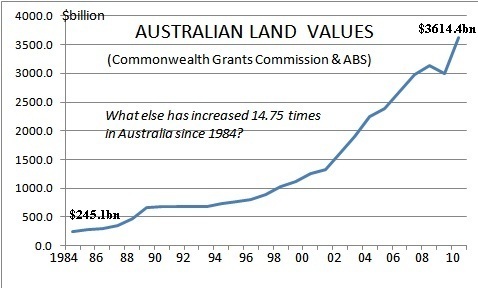 But the Land Values Research Group called the bust on 3 March 2009 – and more than two years have passed since that time? Yes, but the Australian government, having learnt from US and British experience, has managed to “kick the can down the road” by such fiscal stimuli as giving everyone $900, providing pink insulation batts for roofs, and the “building education revolution” construction boom. The national debt attests to the significant level of pump priming that has been necessary to stop the bubble from bursting on the watch of the Labor government. There’s a sort of rough justice in a Liberal government being in power to attend to the leveraged calamity of the bust, because by far the greater part of the residential property bubble was permitted to develop under the Howard Liberal government. Maybe the bubble has already well and truly burst, we are just not being told about it. The rationale being endless ground observations of the huge number of properties for lease or for sale. Endless stories in the local neighbourhood of properties selling at a loss when compared to purchase price of only a few years ago. Losses that go unreported in the media and don’t find there way into the Hedonic Index. Auctions that fail to get a bid going unreported in the clearance rate. Don’t be surprised if the vested interest groups and the powerfull property lobby are purposely manipulating and distorting the data to hide the crash that is already upon us all in the name of keeping the confidence fairy alive and kicking.